Welcome to Savannah River Plastic Surgery! 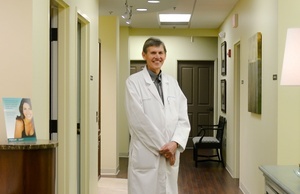 Our board-certified plastic surgeon, Dr. Billy Lynn, and our staff take every measure to offer you excellent care in a friendly, relaxing setting. Dr. Lynn has over 20 years of experience in plastic surgery and specializes in transformations of the breasts, body, and face. Savannah River Plastic Surgery approaches each patient as a partner in the cosmetic surgery process. We take the time to listen to your reasons for considering plastic surgery, discuss your desired results with you, and thoroughly explain the best treatment options to help you achieve your aesthetic goals. Dr. Lynn and our staff are available to answer any questions you may have during your initial consultation, as well as before and after your procedure date – should you choose to have surgery. Our practice is conveniently located in Evans, Georgia, just outside of Augusta. We serve patients throughout east and central Georgia, and South Carolina. We invite you to call our office with any questions or to learn more about our practice and begin your journey toward true physical transformation. For more information about our practice, or to schedule your own personalized consultation, please don’t hesitate to contact a member of our staff at 706-651-8400.